In the first week of the new year, before classes had resumed, thirty dedicated students could be found collaborating, brainstorming, and problem-solving as part of the Client Strategies pilot program. 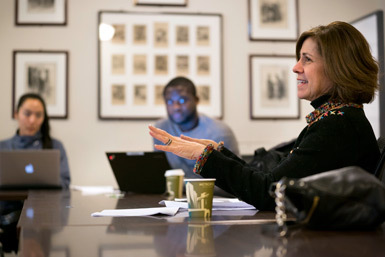 This intensive, one-week program is a key initiative to come out of the Center for Practice Engagement and Innovation (CPEI), which was launched in 2015 as an incubator for ideas about how legal education can best prepare new lawyers for the rigors of practice in a rapidly changing legal marketplace. CPEI grew out of the Law School’s most recent strategic planning process, in recognition of how significantly the legal services sector has changed in the last several years. Professor Jim Lupo, CPEI director, described the three main drivers behind those changes: the reorganization of relationships between lawyers and clients, new legal services technologies, and alternative legal service platforms, such as legal process outsourcing firms. Lupo and his team spent the first year connecting with the practice community through CPEI’s Advisory Board, several forums, and a curriculum design charrette. The goal was “to create a situation where we can incubate ideas about legal education and educational practices by bringing the marketplace into the Law School, by asking the pros, the folks with actual on-the-ground experience with the changes in practice to let us know what aptitudes, skill sets, sensitivities, etc. that our students need to be successful, again, throughout their dynamic careers, not just their first jobs,” said Lupo. Client Strategies was the result of this approach. Through a combination of direct instruction, in-class client problem solving simulations, and group work, the course addressed skills including business relevant communication, financial literacy, organizational behavior/decision-making, project management, marketing/business development, and law practice economics. “It’s a great class for second and third year students to learn the more hands-on, practical knowledge you would want to know for practice, more than just learning the ‘black letter law’ but some of those intangible skills,” said Valerie Brummel (JD ’17). Simulation-based courses, while commonplace in MBA programs, are rare in legal education. Over the course of the week, small teams of students worked through a specific legal issue for a “client”, with additional facts revealed each day. Facilitators played the “client” role, allowing students to put their skills into practice. “It definitely wasn’t anything like a traditional law school class. It gave students an opportunity to flex their muscles in a different way. And because we had teams of 2Ls and 3Ls, we had some that had already had their summer associate experience, and so they were able to fill in gaps within their groups on what their knowledge and experience was,” said Sayer LaGalle, CPEI fellow. The experience of working in small groups was a newer one for most of the students. The students also benefited greatly from engaging with the facilitators, who volunteered their time to provide real-time feedback and perspectives as the simulation unfolded. The goal is to expand Client Strategies to the entire Law School. If the waitlist for the pilot course is any indication, interest is widespread.